Also known as panspeziale, this is Bologna's own Christmas cake. It is lighter and more scented than British festive cakes, and boasts a generous helping of diced chocolate. The flavour improves with keeping, so the candied fruit finish is best added shortly before cutting into the cake. Soak the raisins in the Marsala, cover with clingfilm and leave for at least half an hour, though 1–2 days would be even better. Preheat the oven to 170°C, gas mark 3 and grease a 24cm springform cake tin with butter. Put the chocolate and candied peel in the bowl of a processor and chop until reduced to a rough, slightly knobbly mixture. Sift the flour and the baking powder into a large mixing bowl. Add the grated apples. Heat the honey gently with the sugar, butter and spices. Once blended together (don't let it boil), pour over the apples and flour and mix to a smooth batter. Stir in the chopped chocolate and candied peel, the raisins with the Marsala, the candied fruit, the almonds and the pine nuts. Scrape the mixture into the cake tin and bake for 1–1 ¼ hours until just firm – test by plunging a skewer into the heart of the cake. If it comes out clean, the cake is cooked. Leave to cool for 10 minutes, then take out of the tin to cool completely. Wrap in greaseproof paper, then in foil to store for up to a month. To finish, warm the apricot jam gently in a pan. 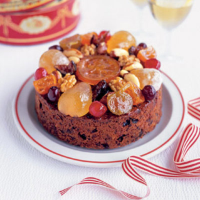 Brush half over the top of the cake, then decorate with the fruit and nuts. Brush over the remaining jam. This rich cake calls for a delicate wine.